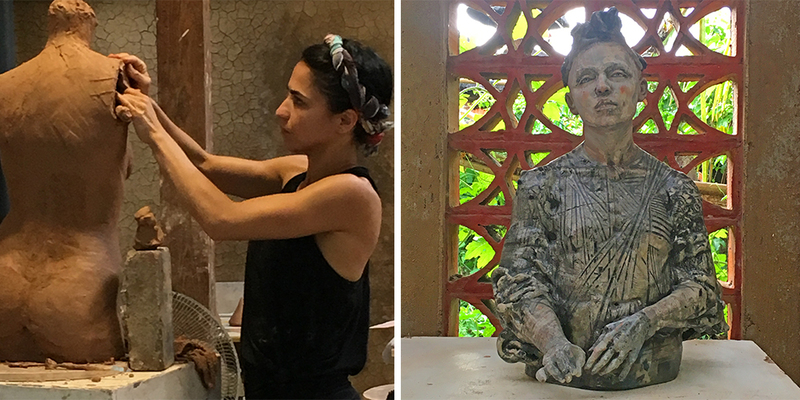 Gaya's resident artist program is an exchange of creative energy, inspiration, contacts, concepts, techniques & enthusiasm for clay. Become a resident artist. For periods of intense and focused growth and creativity, we invite professional ceramic artists from all over the world to bring and exchange creative energy, inspiration and general enthusiasm for clay with our burgeoning community of artists, designers, students and patrons. Open to any mature artist working in clay, we select 3 residents per year for two-month periods of stay. Each selected artist is also welcome and encouraged to invite another ceramicist to join them for the Artist-invite-Artist component of the residency. Portfolio applications are collected annually until mid-August for jury review for the following year. For more information and application details, please contact us directly. Through my work, I seek to generate figurative compositions that explore the boundary between the material driven, sensorial experience of an object and the psychological resonance of our involuntary dialogues with the self-referential. I am driven by the primal act of imbuing an inanimate representation with a sense of presence, transforming it into the inspired repository of our deepest longings and aspirations. My practice seeks to transpose and distill material sourced in the narratives of my culture, breaking it down and layering in search for new formal and conceptual possibilities to uphold insight and self awareness. My goal is to have these compositions perform both as reflections of our shared humanity as well as question socio-cultural notions of gender, race, beauty, and power. I have a deep connection with pattern. It is a visual element that transcends history and material by tapping into human intercultural memory. The human brain inherently seeks and recognizes patterns in our world and every society since the Neolithic age has created designs that contribute to their sense of identity. From the stitching in an embroidered Victorian waistcoat, to the composition of tiles in a Moroccan courtyard, I am fascinated with different ways of producing visual rhythm through repetition. I think of pattern as a concept which can be used to explore the complex relationships between different traditions of making. We build a physical language around ourselves through garments and architectural structures, using disparate materials to communicate in similar ways. Referencing textile and architectural ceramic, I create a pattern narrative around the human body. I make sculptures constructed of small ceramic tiles linked together with fibers, making the rigid flexible as tile transforms to textile. Using the media in this way denies their usual tactility and function, and creates a conversation that spans multiple craft traditions. My illustrated wall tiles examine the same themes in glaze and china paint. By combining personal and historical sources to compose patterns around the body I draw connections between material, time, and culture. Through ceramics, I explore how we organize our lives. With clay as my medium, I am able to constantly seek forceful points of contact between material, technique, and concept, both literally and figuratively. Born in 1986, I grew up in a village in Shangdong before studying sculpture at the Central Academy of Fine Arts in Beijing (B.A. 2010). By adopting the practical methods of craftsmen in my sculpture, I feel both these influences, and become ever convinced that mastery of material and technique allows for communication in its deepest sense. I am fortunate to have been able to communicate with others across Europe and Asia through exhibitions in China, the UK, South Korea, Taiwan, Hong Kong, Spain, Portugal, Norway, and Ecuador. Heidi Bjørgan graduated from the Bergen Academy of Art and Design with a masters in Ceramic Art and Creative Curating. Just like the great American potter George Ohr [whose goal was never to make two identical works], Heidi Bjørgan challenges the notion of what a potter may be by ‘removing’ all traces of acquired professional skills. At times, her ceramic works look as though they have melted and imploded in the kiln, their surfaces rich in texture and bold in colour. Rather than expressing herself through creating new forms, Bjørgan replicates the shape of mundane everyday objects. Already discarded as trash and now combined with clay, her reconstructed objects are given a second chance. Presented in a new context, or even given a different function, they are imbued with new meaning, acquire a new value and offer a different aesthetic experience. Heidi Bjørgan is represented in the collections of the National Museum of Art, Architecture and Design, Oslo; the KODE museum, Bergen; the Ministry of Foreign Affairs, Norway; the Victoria and Albert, London as well as in several private collections. She lives and works in Bergan, Norway. Enchanted by the geometrical design of Japanese zen gardens of stones and inspired by the Japanese art of origami, Ann Van Hoey developed the technique of folding thin sheets of clay. She uses the hemisphere as a starting point, in which she makes incisions in order to recompose the spatial form. The result is a deliberately minimalistic demonstration of purity, form, efficiency and clarity of line, a paragon of geometric and mathematical relentlessness, from which the power of the basic material, clay, radiates. Nathalia Favaro’s work deals with opposing forces coexisting within a delicate balance. Often it comes in three dimensions, sometimes two. Sometimes the color of the material dictates the process, sometimes the color is a choice. Sometimes it occurs by chance, sometimes she has deliberate control. Sometimes it has an organic form, sometimes it has a rigorous geometry. She believes this is the basic dichotomy of life, an ever-changing process one deals with while living in this world. Regarding those points of balance, footholds that allow vulnerability to exist in life and art, she creates her own forms and foundations. In her work she seeks to materialize something timeless and, at the same time, changeable. Besides also expressing herself through other mediums, by working with clay she found a place where she can make all these apparent contradictions coexist and at the same time, come out. Michael is awed by the skill of nature. 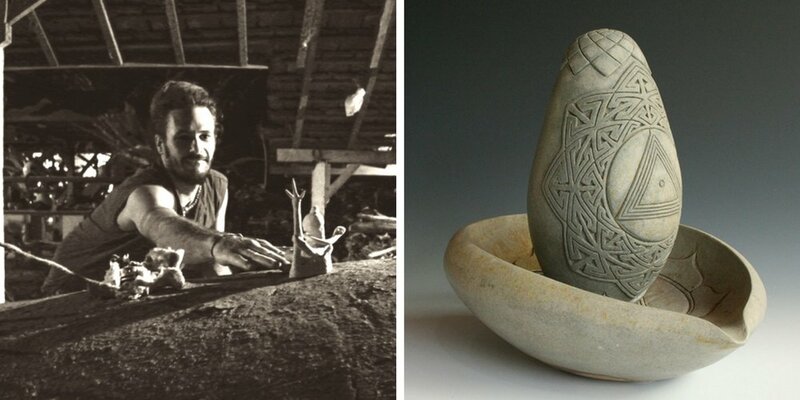 He longed to be able to make things that look as natural as if nature had made them, to create objects that resonate with a timeless quality, with a feeling of a genesis beyond the constructed and manufactured. In his work Michael is attempting to create surfaces and textures that have a timeless quality, something that is difficult to date to a specific culture or place. This complemented with the form of the pieces creates a synthesis which he feel gives them an archetypal presence. Michael's aim is that the aesthetic of the finished object is visually striking but also has a familiarity because of the form and the post-firing techniques that make the most out of the least materials. The finish is straightforward yet complex and therefore creates a dialectic that he feels transcends simple visual meaning, moving into iconic or ceremonial territory. Just as when visiting ruins of a once great civilization you are connected back to something that supersedes your own cultural familiarity, the work should seek to remind you of the past in the present. Lauren makes process based ceramic sculpture and bright, dimensional paintings. 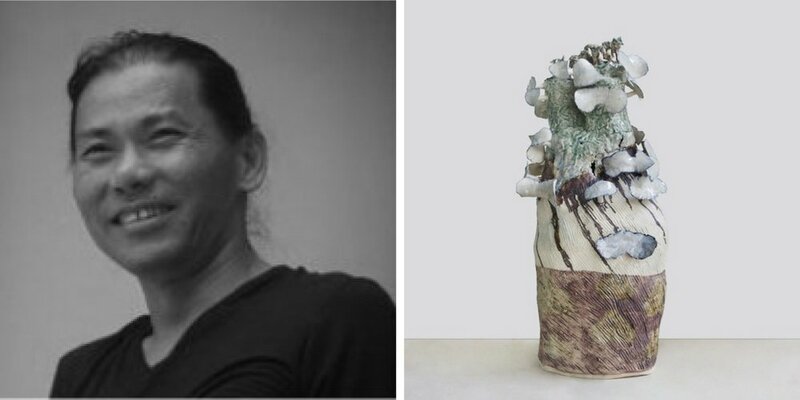 Her obsession with surface and materiality compels her to investigate the relationship between sculpture, painting and ceramics through the inherent qualities of clay and glaze materials. Beyond formal and aesthetic qualities, her work can be understood in relationship to abstract painting, minimal work, and Process Art. Lauren exploits the intrinsic qualities of ceramic material producing works that are warm, seductive, and surprising. Ultimately, Lauren's work is a synthesis of expressive, intuitive surfaces and minimal forms. Juz Kitson lures her audience into an opulent garden and casts them out renewed: an encounter with her sublime installations provokes deeply affective responses, suggesting a form of contemporary shamanism at play. Kitson’s talismanic objects – memento mori meets animist fetish – combine the dexterous arts of ceramics, textiles and drawing with a strong sense of materialism and process. Overtly seductive, the work’s tension lies in resisting the conventions of craft such as the throwing wheel and the plinth, both central to ceramic traditions. Combining porcelain with animal pelts, hides, hair, bone, tusks and husks along with wax, resins and metals to push the boundaries of materialism and challenge the notion of how ceramics has been viewed in the past. These arrangements are exquisite and unsettling object meditations on the intimate relationship between being and non-being. Bound with mystique and feminine power, Kitson’s suspended installations both captivate and unnerve. A wanderer and gatherer of no current fixed address, Sydney born Kitson is a serial artist in residence who divides her time between Australia (where the bush is a rich hunting ground) and Jingdezhen, the Ancient porcelain city of China, a country she first visited in 2009 to work with renowned installation artist Lin Tianmiao. Nick's practice is flexible. Plans are gathered from all areas in his life, he riffs on urban imagery, and intently observe people carrying out particularly unremarkable exercises. Nick's solve domestic problems for himself and those around me through extremely inefficient means with the thinly veiled goal of ending up with an art object. Nick remakes, retools, and rearranges the pieces he creates for the gallery, and push those pieces into public when they fit. He plays the role of sponge and filter, and that of orator, but most importantly he is a curator of his own goings on. Nick's work ranges from the subtly serious to the overtly hilarious. A receding but still present phobia of the independent ambiguous art object keeps him working frequently within the format of the grouping. Objects held in relation to one another provide multiple points of entry and diversifies the paths on which to navigate and understand the work. Nick makes objects in the studio and uses those objects, along with found counterparts and features of the installation space to make his work. For Nick the making process is always a formal one, with aesthetic decisions generally trumping conceptual concerns. Born in Warsaw, Poland. Artist and curator, explorer of abandoned spaces and untried paths. Monika Patuszynska received her MA from the Wrocław Academy of Fine Arts (Poland) in 1999. She exhibits frequently all over the world and has won many awards for her work that may be found in public and private collections worldwide. Monika seeks out the difficulties posed by casting porcelain and is inspired by the process, and most of all by it's errors and accidents. Maria's work comes from the most ancient pottery tradition in her country of Spain and at the same time from a common object in all cultures, the jar or vase. Her vessels have remarkably irregular forms, as their shape is engendered capriciously. Change is the only constant movement, and reflection is vital in order to create a new language. Currently, the most predominant colour in her vases is white. It is obtained by layers of vitrified porcelain and stoneware engobes. The intention is to create a kind of depth that invites the viewer to plunge into the artwork and travel around it. All the while, in the background, there is always some very subtle graphic work, almost like small calligraphy. 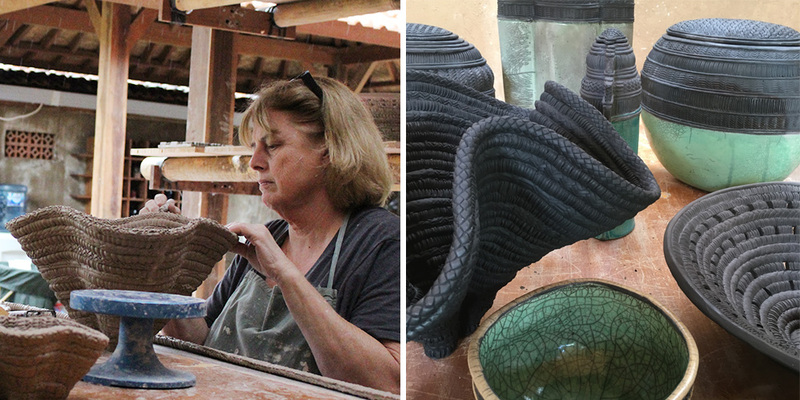 At a technical level she has been forced to do research in assembling thrown and coiled pieces with slaps and lumps of clay, as various hand building methods and techniques can be involved in creating just one single vessel. Naidee has been creating art, painting and sculpting using clay, in Thailand (his native home) and abroad (sometimes working from China and Australia) for more than 20 years. Art has become a part of his life. He is quoted as saying that "[Art] makes me survive, it makes me happy. Making art gives me freedom. I can wake up when I want to wake up, I can create when I want to create, I can go when I want to go, I can sleep when I want to sleep. Freedom is very important for me." A big part of all of Naidee's work relates to his faith... Buddhism, the feeling of peace... While in Bali, Naidee explored some of the cultural and religious gods of Balinese Hinduism. Candone's education is American, her firing technique is Japanese, her glaze influences are from Morocco, and the forms are inspired by ancient architecture and vessels. Candone founded and runs Eat Clay Love a full functioning clay studio and art gallery for people with disabilities to make and market their work in the community and through social media. 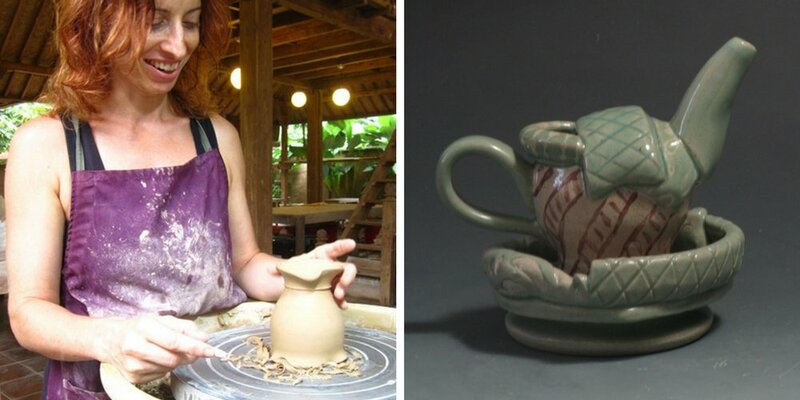 Candone's other projects include Clay Art Travel, which specialize in combining a series of art excursions with an intensive hands on ceramic workshop instructed by Candone and other international artists in Barcelona and here in Bali. Ryan Mitchell's work is focused on one simple task on putting ambiguity and paradox between creation and distruction, artiface and artifact, past and present, symbolic and real, violence and care, part and whole, void and meaning, sincerity and irony, circumstance and intention. Megumi creates her artwork using a combination of shared digital objects, still life objects, digital 3D modeling, open source software and online resources, origami and clay. 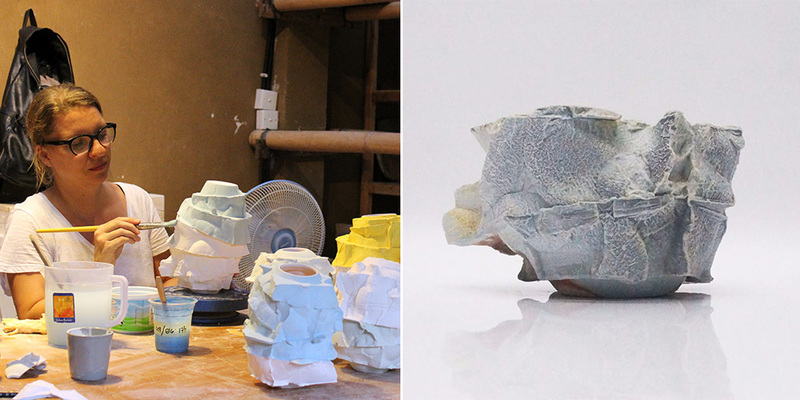 While doing her residency with us, Megumi, inspired by the rice fields that surround the studio, created 3D digital drawings of rices hulls that she then printed and created paper origami models that she then created moulds of which she slip cast before glazing and then assembling on a toten pole. It is (Lars Calmar's) artistic expression, which has raised him to the heights: obese adult men depicted as cherubs; bikers with tattoos; self-confident, naked middle-aged women; fat, wrinkled men; and babies with spoons sticking out of their heads. Calmar’s universe is quirky, aggressive, honest and full of humour. It also has an inevitable touch of something, with which all of us can identify, something deeply captivating and poetic. While Calmar’s primary strength lies in ceramics, he is also a talented painter. Overall, he is a powerful, deeply affecting storyteller. His fundamental delight in technique, sense of perspective and innate artistic flair have made him an audience favourite for quite some time. Adil Writer is a ceramic artist, painter and architect from Bombay, currently living and working in Auroville, where he is a partner at Mandala Pottery which produces functional tableware, assorted ceramic items, and architectural ceramic murals & installations. 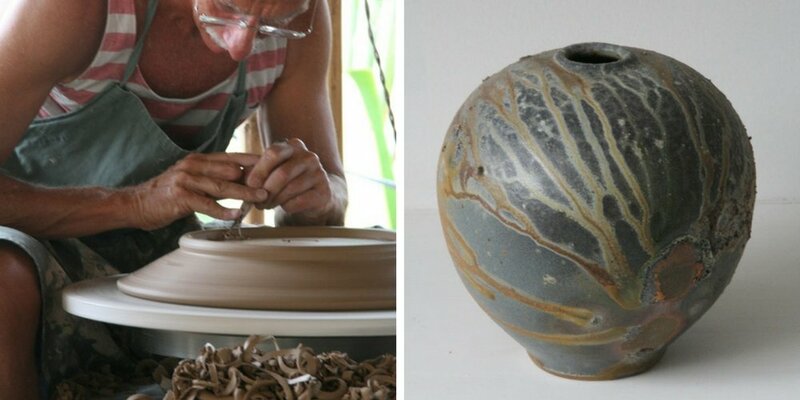 From his own studio at Mandala, he creates his own line of studio pottery. Heidi is a Toronto-based ceramic artist. She found her true calling at 40 when her parents found an essay she had written when she was nine years old – “What I Want To Be When I Grow Up… A Potter.” She left a 20-year career in arts management and radio producing at CBC to apprentice in her father’s ancestral home at the foothills of the Himalayas in India. Heidi returned to Canada and completed her Diploma at Sheridan College in 2012 and subsequently her MFA at OCADU. 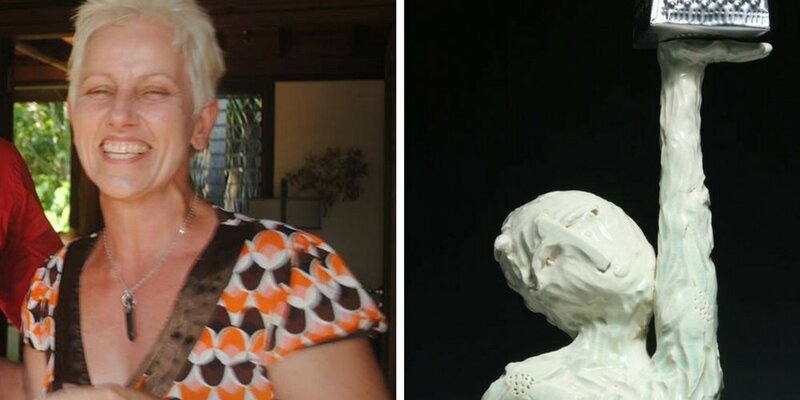 In 2014/2015 the Canadian Clay and Glass Museum Shop featured Heidi’s sculpture in a solo exhibition, ‘Clay in Motion.’ Heidi has worked internationally as an artist-in-residence in China, Indonesia, Denmark, and Australia. She is an award-winning artist whose work has been exhibited internationally including biennials in Hungary and Romania, as well as the Toronto Art Fair. Eva Champagne is an American artist who grew up in Hong Kong, one of the great cultural melting pots of the world. She received her B.A. in Studio Art from Humboldt State University and completed Post-Baccalaureate study at the University of Florida. In 2009 she earned her M.F.A. from the University of Montana-Missoula. Eva teaches ceramic subjects of which include wheel throwing, hand-building, soda firing at low, mid and high-fire temperatures, low-fire ceramic surface techniques, as well as thematic sculptural topics. Eva's artistic research is driven by a need to understand the ontological implications of my own direct experiences, as well as those of the natural sciences especially in the fields of biology, geology and cosmology and the fascinating places where these overlap. Her work seeks to embody an experience of curiosity, discovery, and creative interpretation of recurring systems in flux in the natural world, and raise questions about our relationships to, and within those systems; to create an encounter for viewers that weaves together aesthetic imagination, the visual cultures of science, and the raw sensory experience of material form. Through drawing and sculpture, Eva gives form to her own progressing comprehension of how existence is. In September of 2002 Antra began working with Ray Meeker at the Golden Bridge Pottery, and in the immersion of her life in the medium of clay she found a dynamism that combines the plastic arts with the drama of performance. Vigorously centering 18 pounds of clay on the wheel and pressing it down into a furrowed slab that is then stretched, she produce crack-textured discs, called 'churnings'; a concept drawn from Indian mythology in which gods and demons churn the ocean, separating nectar and poison. In a parallel search for simplicity, surety and stability, she have been inspired by Sengai's seminal Zen painting of the circle, square and triangle. Antra has been exploring 'root forms'; rendering them in three dimensions as a sphere, a cube and a tetrahedron. While at Gaya CAC Alex worked on a collection of skeletal organism like sculptures that were woodfired. Since then Alex has partnered up to create a completely different body of work in comparison to his residency works while at Gaya, under the brand Two Hold Studios. Two Hold Studios brings two distinct design perspectives together that result in a unified vision of dreamy and comforting whimsey. Alexander Clinthorne and Kimberlie Wong first met in 2011 during their Bachelors of Fine Arts Program. Since then, they have both gone on to develop eclectic bodies of work in their own disciplines. Working to each other's strengths, each product is a one of a kind amalgamation of careful hand-pinched porcelain and hand-painted collaboration. Shana Salaff currently resides in Fort Collins, Colorado, where she teaches at both Front Range Community College in Fort Collins, and Aims Community College in Greeley, CO. When not teaching, she makes ceramic vessels that are designed for aesthetic pleasure as well as utility. Shana has said that she is attempting, via her work, to enter into the very personal space of the viewer/user’s home, thus participating in the intimate (and very necessary) rituals of another’s daily life. From the consumption of food to the decoration of the home, function and aesthetics can co-exist in all aspects of life. Each piece is part of a conscious process of experimentation and elimination. Most groups of work begin with my sitting down at the potter’s wheel for a few days and throwing a number of different parts. She then spend the next month or so cutting, attaching, and adding hand-built components to these parts. Although each grouping begins with the vague idea of a finished product, many changes occur along the way. Ryan LaBar grew up in Great Falls Montana in the United States, where he received a degree in Biology and Art from Gonzaga University in Spokane Washington. He has worked as a resident artist at the Archie Bray Foundation, the LH Project, California State University Long Beach, Caldera, including international residencies with exhibitions in China, Bali, Poland, Denmark, Korea and the Philippines. Ryan received his MFA at the University of Nebraska Lincoln. A highlight of his career occurred in the spring of 2015, where he became the first prize award recipient of the Virginia A. Groot Foundation. Shortly before winning the prize, Ryan relinquished his position as the program director of the LH Project to pursue opportunities in Jingdezhen China, where he built a studio and currently resides. Gyan is an artisan craftsman who loves to create beautiful functional works of Art using natural materials and the natural elements. Gyan's background is primarily in woodfired ceramics, which is truly an alchemical creative process. This led him to designing and building woodfired kilns especially for this art, from which he gained technical knowledge and practical skills in brickwork; particularly arches, vaults and domes, natural earth construction and plasters, and stonework for buttressing. These skills have resulted in projects ranging from feature architectural stone walls to custom designed pizza ovens to landscaping and earth wall structures in New Zealand, Australia and Bali, Indonesia. Gyan delights in making simple and beautiful domestic ware that feels good to use. His sculptural forms are of deep spiritual significance and speak of universal creation. Engagement with this process has been one of his biggest life teachers. At every stage, from digging clay to sipping from a cup of warm tea, Gyan feels a deep sense of joy and fulfillment through the dance of thought, action, observation and contemplation. Bruce McWhinney is a practicing Australian artist with over 30 years combined experience in ceramics and art. Nature and travel have been the main inspiration for his work - be it wood fired ceramics, sculpture, paintings or drawings. Frequent trips to Japan including as the director and leader for Arts Of Japan Tours have had a profound influence on Bruce's approach to his ceramics, art and life. 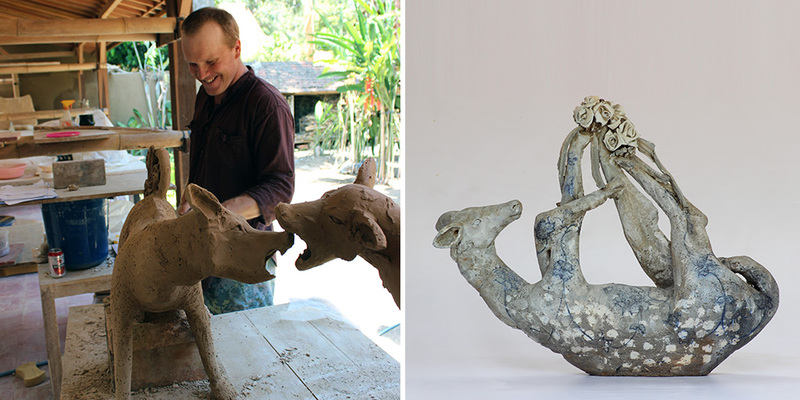 Bruce maintains a studio in Sydney and Ubud Bali and exhibits work through galleries in Australia. His work is in private and public collections including; Shepparton Art Museum, Campbelltown Art Gallery, Manly Art Gallery Museum, and the collection of the curator of the Smithsonian Museum in Washington USA, private collections. Residencies also offer periods of intense experimentation and research such as undertaken in England, Japan and Denmark. Aarti expresses that as her life unfolds, organically, responding to circumstances and changing with them, so to does her work. She explains that sometimes her work expresses and interior life, sometimes an exterior concern; always it is a means to communicate. Intrigued by the paradox of external truths ephemeral moments, she finds herself increasingly drawn to exploring the antipodean nuances of life in her work. Catherine Lane is an established visual artist who lives and works on the stunning north coast of NSW. Catherine has an extensive background in clay and at the outset of her career, following her studies at Charles Sturt University, she trained in the Mingei style of folk pottery in a private studio near Mashiko in Japan. It was here she began to learn about the eastern philosophy of wabi sabi which embraces the notion of beauty in disintegration and imperfection and this remains an influence on her work to the present time. Following extensive travel, overseas teaching and the establishment of a successful ceramics studio with Steve Davies, Catherine’s exhibition work began a gradual shift away from the singular object to incorporate a variety of art-making materials including adobe, papier mache, steel, bone, natural dyes and artificial grass in installation format. This coincided with the completion of her Masters degree at Southern Cross University in 2000. Throughout her career, Catherine has maintained an authenticity to both her ideas and the materials she works with. Nature changes, but the wabi sabi effect of time and disintegration continues. Brian Kakas is an American sculptor that has been working within the ceramic art field for more than 15 years. 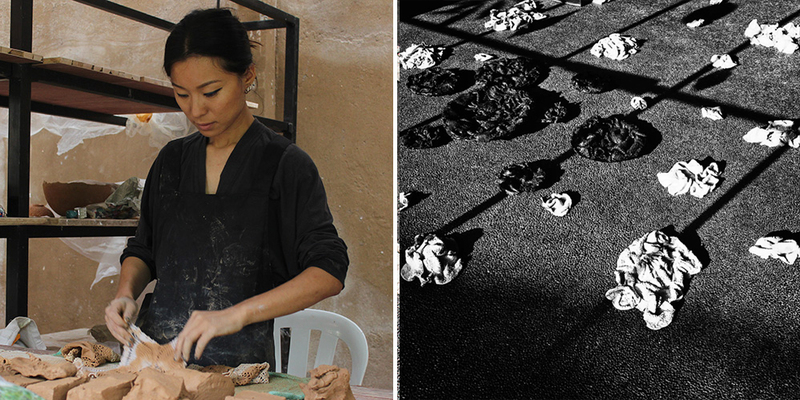 Currently, Kakas is an Associate Professor of Ceramics in the School of Art & Design at Northern Michigan University. In his body of ceramic works, entitled “Tectonic Perceptions”, Brian's intentions is to create a “new nature” in the structural design of ceramic objects. These forms are derived from hybridizations of 20th century structural design aesthetics in architecture, and mathematical theories exploring systems of growth, patterns, and dimensions. These theories include: Cartesian Geometry, Mandelbrot Fractals, Golden Ratio, Fibonacci Sequences, and Gnomic Spirals, and are applied to the ratios and dimensions of segments within the modular mold fabrication system. The works are intended to incorporate mathematical theories which influence, but do not establish finite parameters. Numerical components of the theories remain irrational; concepts of the ratios are focused upon allowing the creation of intuitive sculptures. Regarded as Singapore’s next master ceramist, Jason Lim’s artistic growth over the past decade has been remarkable. Also a performance artist, Jason combines skilled craftsmanship in sculpting with influences from performance art. The result is ceramic pieces that go beyond being merely objects of beauty, to subjects that provoke thought and interaction with the viewer. Jason’s ceramics transcend the tradition of functionality. Almost sculptural instead, his works take on strikingly organic forms – an asymmetrical plate, a sealed vessel or a perforated bottle. Deliciously earthy yet fragile, the duality in his works prompts one to ponder over the creation process, while their asymmetry provokes a rethinking of balance and symmetry. Unpretentious in nature, Jason’s ceramics exude a beautiful stark rawness that reflects the artist’s skill and energy. Steve Davies (1964- ) was born in Horsham, Victoria. He started exhibiting soon after obtaining a Diploma in Applied Arts from Charles Sturt University in 1984 and, since then, has participated in a wide range of professional activities in Australia and overseas, including residencies, workshop facilitation and management and lecturing in the TAFE system. From 1992-2000, he was a member of David Jones' Craft Australia Boutique in Sydney. He has also found time to further his studies, obtaining a Graduate Diploma in Visual Arts (ceramics) from Monash Univerity in 1996, a Master of Visual Arts (Ceramics) from Southern Cross University in 1998 and a Bachelor of Education from Charles Sturt University in 2001. In 2008, he established the Studio 9 Artspace in Uki in NSW's Tweed Valley. At last count he was living and working in South Golden Beach near Byron Bay. In his ceramics practice, he makes highly decorated and colourful domestic ware and one-off pieces signed with an incised 'S. Davies'. Accomplished potter and teacher of many decades with exceptional skill in throwing large scale ultra thin-walled vessels, Dave Handley created a beautiful body of work during his residency at Gaya CAC. Following his employment at Turquoise Mountain (TM) in Kabul Afghanistan as Head of Department for the Institute of Afghan Arts and the School of Ceramics where he worked with master potters, tile makers, and students from a traditional apprenticeship pottery village outside of Kabul in the mountain village of Istalif, Brad undertook the position as our very first Resident Artist, and assisted in constructing our first wood-fired anagama.